The dishwasher is our go-to cleaning machine after a big family meal. Those who do not have a dishwasher, they wish they have. Those who have one in their kitchen, know how easy it is after a big family meal to just put all the dishes in the machine, and let it do its magic. But every now and then you need to return the favor to your dishwasher. You need to clean it, so that it keeps running as smoothly as possible. You might say that cleaning the appliance that cleans your dishes is unnecessary. However, regular maintenance is important to keep your dishwasher running at maximum efficiency. The good news is that there is a very easy way to do it. The best way to clean your dishwasher is with some household cleaning products. No, you do not need to buy expensive chemicals from the store. You have all the ingredients at home. You need a container, baking soda, and white vinegar. Here is how to clean dishwasher with household products. 1. Start by clearing the drain. You need to remove the bottom dish rack. Inspect the drain, and remove any gunk or food that is left there. This step will improve drainage and increase the cleaning efficiency of your dishwasher. 2. Step two is a vinegar wash. You need to start with an empty dishwasher, and then place a cup of white vinegar into the dishwasher-safe container on the upper rack. Run the machine through a hot-water cycle. Vinegar will help wash away any grease and grime, as well as remove musty odors. These odors might bind to your dishes, so do this process once a month. 3. Last step is the baking soda rinse. 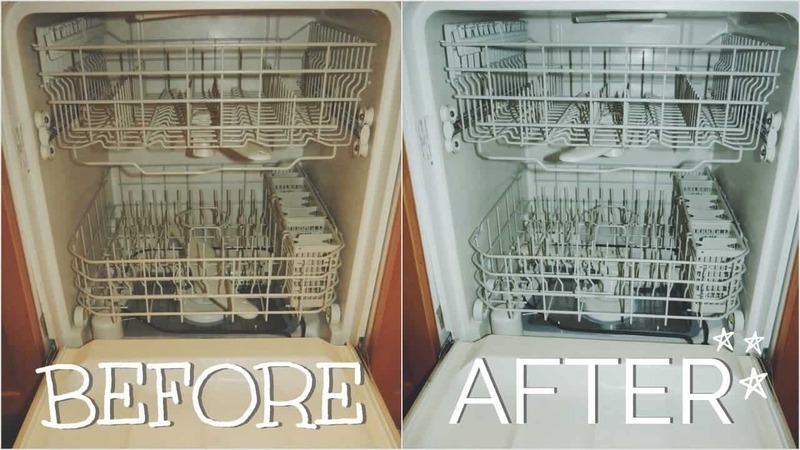 Just sprinkle a cup of baking soda across the bottom of the dishwasher. This time, run a short, hot water cycle. After the rinse, your dishwasher will have fresh smell, and a brightened and stain-free interior. If you want a more thorough cleaning of the dishwasher, you need to clean every part of it. If the front is made of plastic, you can use a sponge and hot soapy water to wipe it down. If you have a dishwasher made of stainless steel, use a glass cleaner to remove the built-up grime and fingerprints. Do not spray the cleaner directly onto the dishwasher front. Any moisture can damage the electronic controls. You can spray the cleaner onto a paper towel and then apply it. Cleaning the filter is vital for eliminating the grinder on the self-cleaning dishwasher. You can clean the filter once a week or every two weeks, depending how often you use the dishwasher. For cleaning the filter, pull the bottom rack and remove the filter system. The system consists of several interlocking parts, and you will notice a center cylinder that unscrews. This will allow you to lift out the system and take it apart. Clean every part individually at the sink. Check the spray arm for trapped food scraps. Rinse the arm under the faucet. If your home has hard water, over time, discoloration will form in the dishwasher’s interior. For the sanitization part, use the household product we mentioned earlier. That means running vinegar through a hot cycle, and following up with baking soda.